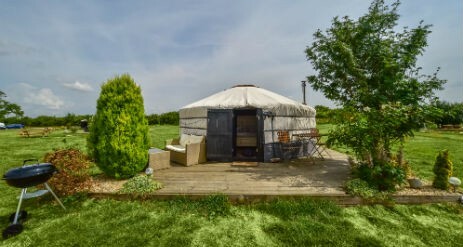 At Lincoln Yurts we are a yurt only glamping site nestled just a mile away from the beautiful village of Welton in Lincolnshire within an 11 acre equestrian farm. 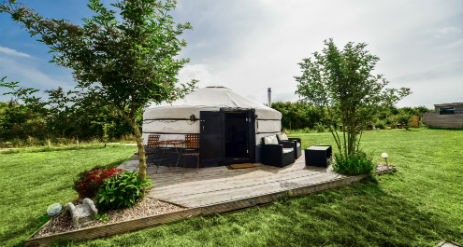 Our five yurts are authentic Mongolian yurts, not single skin tents, and are to such a high standard that we can open all year round, they are cool in the summer and very well insulated for the winter. The sunsets are breath taking, our skies are massive, you can really take the time to unwind and truly relax around an open fire or cosy up in your yurt with your log burner. 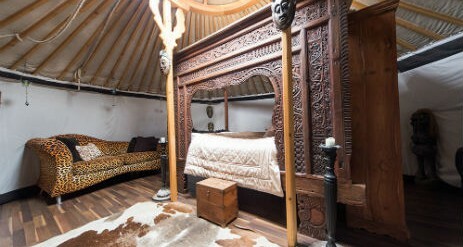 We have 5 themed yurts spaced equally over a 3 acre site. Each yurt has it’s own private bathroom, Weber BBQ, hard standing for fire pit hire, decked area with seating, wooden bench on the grassed area. When you can stay in our yurts, we have everything from a 125 year old balinese wedding bed to a super king sized four poster, seriously, have you seen our beds? All our duvets are Siberian goose feather, extremely warm and amazingly comfy, also all our bedding is designer, a great combination to the perfect nights sleep. 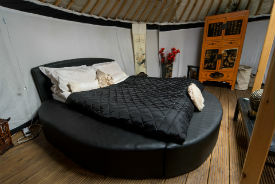 Each yurt has a different mattress to suit every taste of which our high quality from Tempur to ViSpring. The feel of a small campsite, we will never have more than 12 adults including yourselves at our site so you can truly relax and unwind. We will leave you completely alone if you want or need us to, if you need anything then we are on the end of the phone! 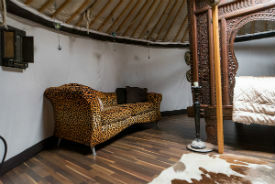 Our most popular yurt, the main feature you see when you first walk into this yurt is the 125 year old hand carved rosewood wedding bed, you can actually smell the wood, its a stunning yurt that is most peoples first choice when booking with us. This is the smallest bed on site, a modest double. The balinese has no electric and is lit with over 40 candles and heated with the wood burner, first time campers may want to bring an extra lantern as it is quite a dim yurt at night even with all the candles lit. Kids love to sleep on the leopard print chaise longues but there is plenty of room to fit 2 camp beds comfortably for them also. 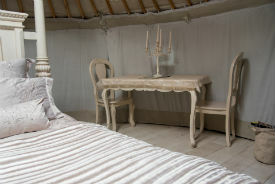 The couples only yurt, the shabby chic yurt, the romantic yurt the beautiful french yurt. This is a very popular yurt, its very romantic, when we get phone calls normally from guys asking which one is the best we always answer if you are looking to impress someone then go for the french yurt. The bed is HUGE! its a super king size four poster bed. This is the only yurt with the bed exactly in the middle, next to the wood burner is a large table and chairs to the other side of the bed is a dressing table and drawers but its what is behind the bed that is the surprise…..we’ll spoil it for you, its a piano that we decorated in sheet music, mainly oasis sheet music. The french yurt is a clean white yurt with with flooring a cream rugs and a super comfortable orthopaedic mattress which is great for bad backs. This is a couples only yurt so (i’m sorry) but no kids allowed, this yurt has no electricity and is lit by candle light and heated with the wood burner (perfect) a firm favourite for anyone wanting that wow factor, the french yurt will not disappoint. The Gothic Yurt has a 6 foot bed head with a carved vampire face which is really cool, the yurt is quite dim as most of the furniture is black, for some reason it just lights up amazing with the candles. 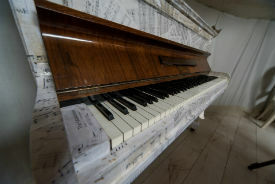 We have a now badly out of tune piano in here which all adds to the atmosphere the gothic yurt creates. 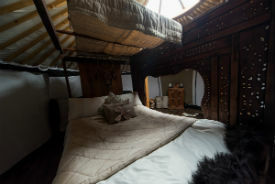 The yurt is very boudoiresque and is situated right in the very corner of our farm, so what happens in the gothic yurt stays in the gothic yurt. The yurt is big enough to sleep 2 adults and up to 2 children comfortably, the gothic yurt is the furthest yurt away from the toilets and showers (still less than a 2 minute walk though). This is a big family yurt as it is the only yurt that takes 3 children and although it has one of the biggest beds on site it feels like it has so much room, there is a heater and electricity inside this yurt perfect for extra lighting and charging up phones or laptops, its a very simple yurt with not much that the kids can break but also is a favourite for many couples who want electricity and a HUGE BED! 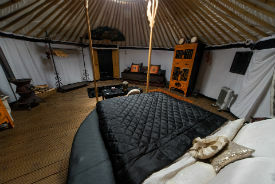 The oriental themed yurt has a kingsize tempur mattress although the bed looks and feels much bigger with its huge surround. 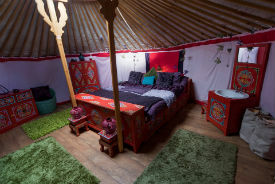 It has electricity so you can charge your phones or plug in a projector and watch a film on the yurt curtain in the privacy of your own yurt, there is a single led light which is adequate enough to light up the yurt but not intruding enough to take away from that fact that you are camping. It’s the closest yurt to the toilets, it has a heater and electricity so if your children are anything like mine you will need that to charge up whatever they use to be on social media or to watch tv then this is a fantastic yurt, it feels like it has more space than the other yurts here even though they are all the same size (the tardis yurt) this is definitely a favourite for many of our returning guests. 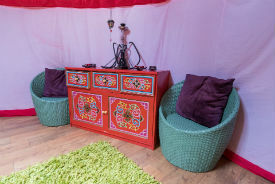 INSIDE OUR YURTS YOU WILL FIND…. 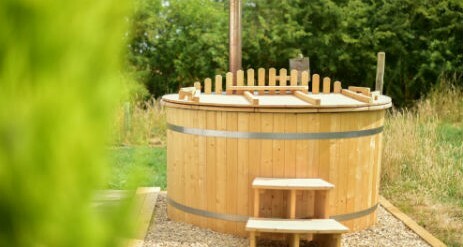 OUTSIDE YOUR YURT YOU WILL FIND…. Every yurt has it’s own private bathroom consisting of toilet, sink, shaver point, steam cabin and foot massager. Towels can be supplied at an extra cost on request. 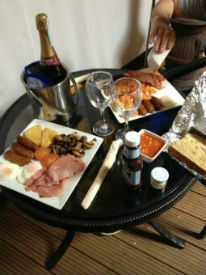 THE BEST COOKED BREAKFAST IN LINCOLNSHIRE! We offer THE best cooked breakfast in Lincolnshire, our breakfasts are an additional extra as sometimes people like to cook their own but for around £6 we will hand deliver a piping hot breakfast to your yurt so you can have breakfast in bed and then come and take away your plates. You can have an outside fire! At our farm you can sit around an open fire outside and see one of the clearest skies in the UK (our stars are stunning on a clear night). We offer a 2 night minimum stay during the weekends and even 1 night stay if we have the availability. We do not charge you extra to burn wood inside your log burner in your yurt,all the wood you will need will be inside your yurt on arrival…….need more? No problem, no charge, this is the same with all your firelighters, kindling, candles, toiletries, gas for your gas stove, teas coffee’s and sugar. 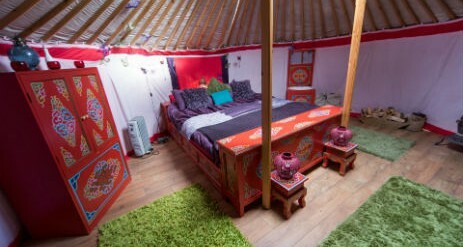 Two of our yurts have electricity and we do not charge anymore for them than we do for the yurts without. However if your phone/laptop runs out of power then we will charge it for you.